Casal dels Angels School, promoted and directed since 1958 by the Parish of San Isidro Labrador, emerged in the tradition of Catholic parochial schools. Since then, it has enjoyed the confidence of a large number of families who have entrusted the education of their children becoming a reference school in Barcelona. A school with the prestige and reputation of the Casal dels Angels needs to live up to the expectations of families who entrust them with the education of their children. Therefore, they regularly adapt their teaching tools with the latest technologies. In this case, they needed to update eleven classrooms with the latest technologies, incorporating solutions for teaching through interactivity and cooperation with students. Two options were considered during the process, the interactive whiteboards with projectors and the interactive LCD screens. They rejected the whiteboards solution despite it being the most economical solution, it was not technologically the most advanced option, nor the most dynamic. 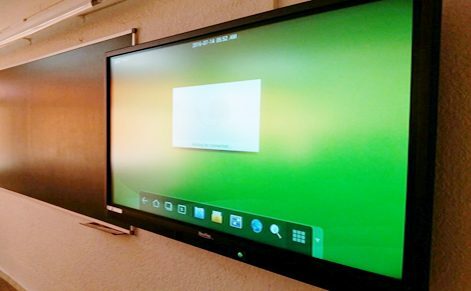 In addition, the school wanted to put aside the maintenance of the projectors service.When their reputable dealer introduced them the Newline products, they undoubtedly chose the TT-6515B 65” model with an integrated OPS PC, a complete solution to update their teaching methods. The screens have been permanently incorporated on the walls of the eleven classrooms. School teachers use them daily, managing the interactivity and participation of students in the classroom at all times, having access to many more tools than they ever have before.